UNMATCHED FLEXIBILITY PROVIDES A SIMPLE, UNDER-COMPLICATED USER EXPERIENCE. Start with a pre-built solution then tailor the software to meet your individual needs. Fully customizable. No custom code. The geodatabase is the single, authoritative asset repository for all things spatial. Utility Billing, ERP, Fleet, SCADA, 811 & More. Track any type of work on any type of asset. Manage work history, asset condition information, business risk analysis, and much more. Elements XS is a commercial off the shelf application that includes building blocks and tools for each client to configure their own unique processes, data collection requirements, interface configuration, and much more. Users can configure unlimited custom data fields, unlimited custom forms and custom form layouts, and unlimited custom workflow processes - all without modifying application code or requiring custom application development. Elements XS also includes many options for pre configured templates and workflows to streamline deployment the process. Elements XS provides tools to tailor menus, page layouts, map toolbars, and other interface components to reduce clutter and streamline data collection processes. Each user (or group of users) can have a tailored interface that contains toolbars, buttons, map settings, forms, and other functionality specific to their individual job function. The Elements XS Workflow Designer provides a drag and drop interface for users to design and deploy custom business processes. Trigger an unlimited number of user-defined events, actions, notifications, and more when user-defined scenarios occur in Elements XS. Select multiple types of assets consisting of multiple feature classes and create Service Orders for all assets at once. Auto-add labor, materials, and equipment costing data based on feature class data across multiple feature classes at once. Notify a supervisor when a job has been completed and requires review. Notify a citizen when a ticket they’ve submitted is in progress or has been completed. Auto-generate a Service Order to send the Mechanical Rodding Vehicle to a sewer line when an inspection indicates the line should be rodded. Elements XS utilizes a single document type, called a Service Order, to reduce the learning curve and eliminate confusion regarding which type of document should be created under which scenario. Service Orders in Elements XS combine features from and replace documents known in other applications as Service Requests, Work Orders, Inspections, Work Requests, Maintenance Requests, Preventive Maintenance Records (PMs), and more. A Service Order in Elements XS tracks the problem, the resolution to the problem, labor, materials, equipment usage and much more. Service Orders also contain unlimited user-defined data collection fields based on the type of work being performed and are used for asset inspections, recurring maintenance activities, preventive maintenance activities and more. Elements XS can be deployed with pre-configured Service Order templates and categories based on the type of organization utilizing the application. Users can then modify these templates to suit their individual needs, reducing configuration time and providing a solid foundation for asset management. Elements XS includes tools for users to create in-app and email notifications based on any user-defined criteria. An intuitive Home Page dashboard as well as map based data views help ensure users are aware of new items coming in and provide insight as to how each Service Order Task is cycling through it’s respective workflow. Elements XS also allow users to send outgoing emails directly from the app and relate those emails to assets to track communication with customers, contractors, and other contacts. Setup routine maintenance activities and auto-generate future maintenance tasks for both spatial and non-spatial infrastructure based on user-defined cycles and user-collected data. Trigger routine maintenance based on calendar cycles and/or data points (hours, mileage, costing data). Adjust maintenance schedules based on user-collected data (if the inspection scored above 90% schedule the next maintenance activity for 12 months later, if the inspection scored less than 40% schedule a follow up activity for next week). Elements XS allows users to create and utilize as many custom data fields as necessary. These fields can be applied to Service Orders (based on the type of work being performed) or other data collection forms such as permits, licenses, inspections, and more. Users can perform calculations and analysis on custom fields, define which fields are required, define how the fields are presented to the users (via custom form layouts) and utilize custom fields to trigger follow up actions and events throughout the software. Set user-defined criteria to trigger user-defined actions and events throughout the application. Unique to Elements XS is the ability for users to create their own unique parameters and conditions to trigger their own unique series of follow up events. Elements XS contains a dynamic data management technology that allow users to define an unlimited number of custom fields with an unlimited number of custom form layouts to suit the unique needs of specific processes within an organization. Based on the type of work being performed, users can add as many user-defined fields as they’d like and decide how those fields should be presented to the end user. Elements XS allows full usage of HTML5 controls for picklists, sliders, date selectors, and other user interface tools to streamline data collection methods. System administrators can decide which fields are required and which values on the form may trigger follow up actions or events in other areas of the application. Users can also generate data collection forms that may not necessarily be related to Service Orders - such as permits, licenses, and inspections. These custom forms are user-generated and can trigger events (such as Service Orders) or notifications when any user-defined criteria or scenario occurs within the application. Users can create custom workflows using a drag and drop interface to automate and streamline processes. These workflows can be used to trigger follow up events, route work to designated personnel, send notifications, and much more. These user-generated custom workflows can be applied to any scenario and provide an unmatched level of customization throughout the application. Elements XS includes a workflow processing engine that allows users to analyze data from any combination of third party applications and/or datasets to trigger events within Elements XS based on criteria from these external sources. Common uses of the workflow processor include 811 automation (for one-call locates / tickets), SCADA system integrations (to trigger Service Orders when alarms are issued), and fleet management (trigger vehicle maintenance Service Orders based on fuel consumption or other criteria). your native ESRI map services. No copying, not synchronizing, just referencing your GIS in it's native format. 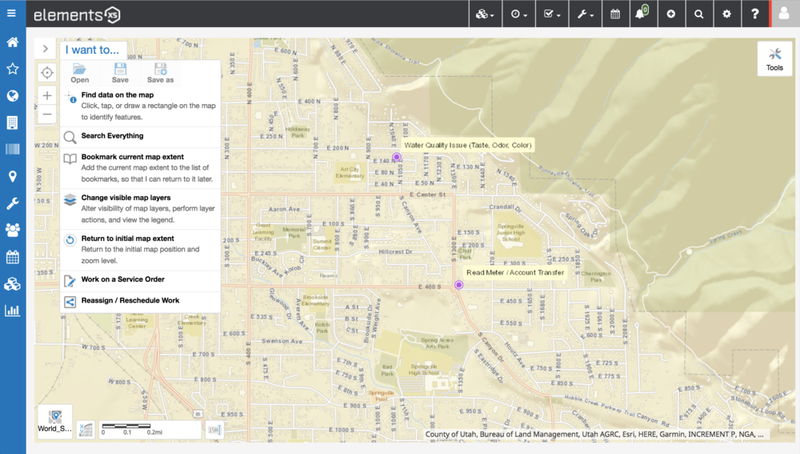 Elements connects directly with an unlimited number of map and/or feature services that have been published via ESRI’s ArcGIS Enterprise and/or ArcGIS Online. Elements XS interacts directly with published REST endpoints and there are no limits to the number or types of map services that can be utilized, so long as they are supported by the native ESRI platform. Read / write feature access permissions are controlled at the user level and all interaction with map services is real time; the geodatabase is the single, authoritative dataset for all spatial assets and no data is copied or synchronized. Users can easily integrate query layers to graphically represent any dataset within Elements XS such as locations of work, labor, types of work, job costing details, and more. Setup geofences to define job routing and other workflow processing criteria; heat maps, feature clustering, and map-based reporting also enhance the GIS integration experience. All map viewers are built on HTML5 technology and will work on any device in any standard web browser. Elements XS also offers a direct integration with Geocortex Essentials by Latitude Geographics, providing the most flexible, best performing web map viewer on the market. The GIS integration in Elements XS allows users to update feature data directly from Elements XS documents and/or update Elements XS data using GIS feature data to seamlessly share data and provide optimal performance. Generate asset condition scores based on maintenance data together with feature class data such as age, material, and other factors affecting the life expectancy of an asset. Use Elements XS to analyze this data and auto-generate maintenance activity for assets that fall within user-defined condition scoring parameters. Use Elements XS to generate a maintenance score each time maintenance is performed on an asset. View maintenance scoring trends over time and auto-generate activity based on maintenance scores. Quickly find all assets where the latest maintenance score is poor and auto-generate Service Orders for these assets. Elements XS includes reporting tools to assist with GASB and PSAB requirements. Use Elements XS to view which assets are nearing the end of their lifecycle and estimated repair / replacement costs for these assets. Elements XS includes many pre-built reports to track information common to the majority of Elements XS customers. All reports can be modified to suit the individual needs of an organization using the included reporting tools. Elements XS includes a report designer to generate tabular reports, an analytics designer to generate dashboards, and tools to generate spatial reports that are seamlessly integrated with your GIS. Elements XS also utilizes an open Microsoft SQL database so any other reporting engine can also be used if desired. All reports can also be exported to Excel, PDF, HTML, Text, CSV, Rtf, and image. The Analytics Designer is also a client side tool included with every Elements XS deployment. This designer allows users to create dashboards based on any data collected in Elements XS. Pre-built dashboards can be modified to suit specific needs of an organization or users can create new dashboards based on pre-built SQL views designed to provide quick access to the most commonly used data in Elements XS. The Elements XS Report Designer is a client side tool included with every Elements XS deployment that allows users to connect to the Elements XS SQL database to modify existing report templates or generate new reports. The drag and drop interface provides industry standard reporting functionality as well as tools for charts, graphs, and more. A picture is worth a thousand words - use your GIS to display areas with high concentrations of labor, work, or other user-defined criteria. Access labor, equipment, and materials usage and analyze asset conditions from the map. Spatially view data from any report or dashboard in Elements XS. USE THE MAPS, OR DON'T. Whichever IS QUICKEST AND EASIEST FOR YOU. The Dispatch Workspace in Elements XS is a unique interface designed to illustrate which tasks are currently assigned to which users and help dispatchers balance the workload. Users can quickly reassign work and ensure high priority tasks are being addressed. The integrated resource management calendar in Elements XS illustrates time slots scheduled for employees and resources such as equipment. This interface provides quick access for employee and resource scheduling to optimize field operations. The integrated calendars in Elements XS display Service Order information as well as user-defined documents such as permits, licenses, inspections, and more; simply click on an event to open the related record and view additional information. multiple warehouses and storage locations. Create a storage hierarchy with unlimited tiers to track where individual inventory items are stored - for example, a part may be at Warehouse A → Level 1 → Isle 1a → Shelf 3 → Bin 1. User permissions determine which users can access materials from specific inventory locations in order to ensure users aren’t consuming materials they don’t have. Set low stock alerts and track material stock levels at multiple locations for each inventory item. Elements XS includes tools to track vendors and associated contacts for each vendor. Multiple vendor part numbers can be tracked for each inventory item to help track which vendors historically provide the best prices for individual inventory items. When consumed on a Service Order Task, each inventory item in Elements XS can be set to reference a fixed sell price, weighted average, most recent price paid, or most recent price paid plus a defined markup percentage. Create Purchase Orders and Item Receipts to track which parts have been ordered and which parts have not yet been received. When parts are received, stock levels are automatically adjusted and as materials are consumed on Service Order Tasks the stock levels for these materials is adjusted accordingly. Use the Purchase Orders to order services from vendors and contractors and track which services have been paid for. A Purchase Order indicates that inventory parts have been ordered. Key information collected on a Purchase Order includes the date the order was placed, who placed the order, which parts were ordered, how many of each part were ordered, the vendor from whom the parts were ordered, vendor contact information, expected delivery date, and the inventory location to which the the parts should be shipped. Purchase Orders remain Open until all parts on the order have been received using an Item Receipt; this provides a system of checks and balances to ensure all orders are accurately fulfilled and prevents vendors from sending (and billing for) too many or too few parts. Elements XS also provides the ability to associate multiple Item Receipts with a single Purchase Order to properly manage partial shipments. Item Receipts increase stock levels and are created when shipments are received. When inventory items are received at a warehouse using an Item Receipt, the quantity of the specified inventory items on hand at an inventory location are increased by the quantities indicated on the Item Receipt. Key information tracked on an Item Receipt includes the date the parts were received, who received the parts, the location where the parts were received, delivery method, a list of the parts that were received, and the quantity of each part that was received. Item Receipts remain “Open” until a Vendor Bill or Invoice has been input for the parts received. User permissions in Elements XS determine who can create, modify, and delete Item Receipts. Vendor Bills are used to determine how much money is paid for inventory parts that have been received. After inventory parts have been received using an Item Receipt, a Vendor Bill is created. Information on the Vendor Bill includes the vendor invoice number and the prices paid for each inventory item that was received into inventory. Once a Vendor Bill has been associated with an Item Receipt, the inventory receiving process has been fulfilled. Invoices are generated to reduce inventory stock levels and track the cost of inventory parts going out, using whichever inventory valuation method is preferred (FIFO, LIFO, Weighted Average). Key information tracked on an Invoice includes the date the inventory parts where used, the quantities of inventory parts used, how the parts were used, and the price paid for each of the parts that were used. Invoices are automatically generated whenever inventory parts are used on a Service Order. Invoices can also be manually generated to reduce stock levels when items are depleted from inventory without using Service Orders. We understand that portability of data is critical, so we do our best to help. Elements XS includes tools for a live connection to multiple utility billing applications to provide location, customer, meter, and service data to field technicians in realtime directly from the utility billing application. Tools to update the utility billing software directly from Elements XS are also available to avoid duplicate entries. Utility billing data can be visualized in the GIS to show consumption data, usage history, and other field-critical data. Use the included workflow processor in Elements XS to seamlessly integrate with your SCADA system. When the SCADA system sends an alarm, the alarm is picked up by the Elements XS workflow processor and a Service Order (or other appropriate record type) is auto-generated in Elements XS and associated to the correct asset(s). Users are notified of the new Service Order and the transaction between the SCADA alarm and Elements XS is seamless. Elements XS includes tools to view and interact with CCTV videos without any custom configuration or application development. Open a sewer line and quickly view data from third party video inspection software. Use the Elements XS workflow processor to analyze data from video inspection software to auto-generate Service Orders and maintenance activity based on events in the video inspection application. Use Elements XS to view and analyze data from third party fleet management software including snow plow routes, vehicle location data, and auxiliary data including when a plow blade was up / down and how much sand / salt was utilized throughout a storm event. Using the Elements XS workflow processor, follow up events and can be auto-generated based on the data collected in third party fleet management applications. Dig safe. Bluestakes. Mark out. One call. 811. Every state calls it something different - regardless of terminology, when a new ticket is received Elements XS can process the ticket, show the geography of where the mark out is required, auto-generate and auto-assign a Service Order to mark the ticket. The ticket is displayed on a mobile device where field staff can click on the ticket on the map, take one or more pictures, make notes about how the line was marked, and close out the Service Order. For states requiring a positive response, Elements XS can push data back up the chain and submit a response to the one call center that the ticket has been marked.